Bouillon or stock cubes are handy little servings of dehydrated vegetables, salt, and seasonings that are full of flavor (but not really anything nutritious). Vegetable stock or bouillon is perfect for starting many different kinds of soup, risotto, gravy, rice, and a variety of dishes. The problem is that most store-bought versions, although being vegetarian or vegan, often have onions and garlic in them. And as Vaishnavas, we try to avoid these and other plants in the allium family. Note: this soup-starter calls for a lot of salt that acts as a flavor and a preservative. You can store this in the freezer where it keeps well, and because of the salt, it’s easy to scoop out as you need it. Use one tablespoon per cup of water. Hint: You will need a food processor for this. No matter how large or small, you will want to consider processing these veggies in batches. I suggest chopping up the veggies and mixing them in a bowl, then processing them in batches, then mixing this in another large bowl. If you do all of one veggie, it might get too wet or too dry. * The salt! Because vegetable sizes vary each and every time you make this, the amount of salt you use will be based on the final quantity of the processed veggies. This recipe usually makes between three and five cups of soup starter. You will need 1/3 cup of salt for every 1 cup of processed vegetables you end up with. That sounds like a lot, and it kind of is, but trust me on this! 1. Chop your veggies into manageable sizes and toss them in a big bowl. Take the green top off the fennel, and trim any dry or brown spots off the bulb, and then chop it into chunks. My rule of thumb is my thumb. Get your veg down to chunks the size of your thumb for easy processing. 2. 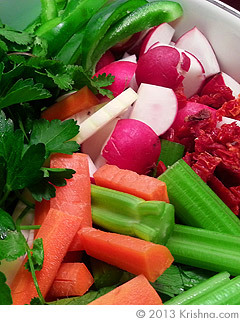 Carrots and radishes can be chopped a bit smaller since they break down slower. Celery (leaves and all), tomatoes, and peppers can be chopped larger because they break down faster. I like to remove as much of the cilantro and parsley stem as possible because it gets pretty fibrous in there. 3. Once you finish chopping the veg and get it in your big bowl, mix it up a bit and put it through your processor in batches. I have a 9-cup processor and I run it in three batches so I have enough room. You want to get to a lovely pureed texture without getting too mushy. You should still see little bits of individual vegetables in there, almost like looking at beach sand where you can still see bits of shells. 4. After you’ve processed everything and given it a good stir in a big bowl, measure it out to see how many cups worth of puree you have. Don’t worry about being exact, just give yourself an idea so you know how much salt to stir in. 5. 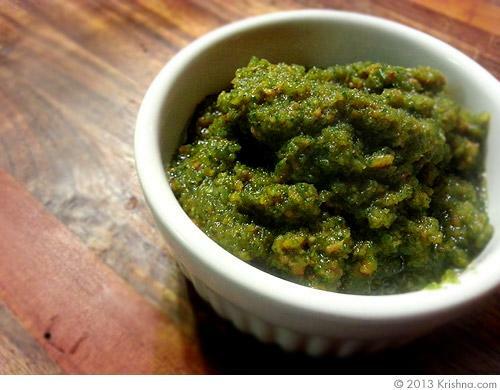 For every 1 cup of veggie puree you have, add 1/3 cup of salt. So if you have 3 cups of puree, stir in 1 cup of salt. If you have 4 cups of puree, stir in 1 and 1/3 cups of salt. And so forth. Variations: since this makes a lot of soup starter, you might try splitting it up into batches and add seasonings you often use in your cooking. For example, try adding pepper, lemon juice and lemon zest. Or maybe cumin, curry powder, and a little cayenne. This is a versatile stock recipe that you can easily adjust for your own cooking style.